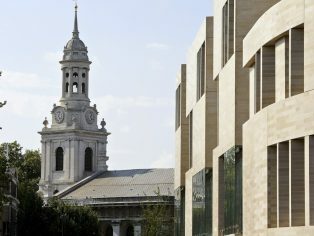 Located in the UNESCO World Heritage Site at Maritime Greenwich and opposite Hawksmoor’s St Alfege, this building, with all its frisky gravitas, provides the main university library and the departments of Architecture, Landscape and Arts. It is a startling building to put in Greenwich. 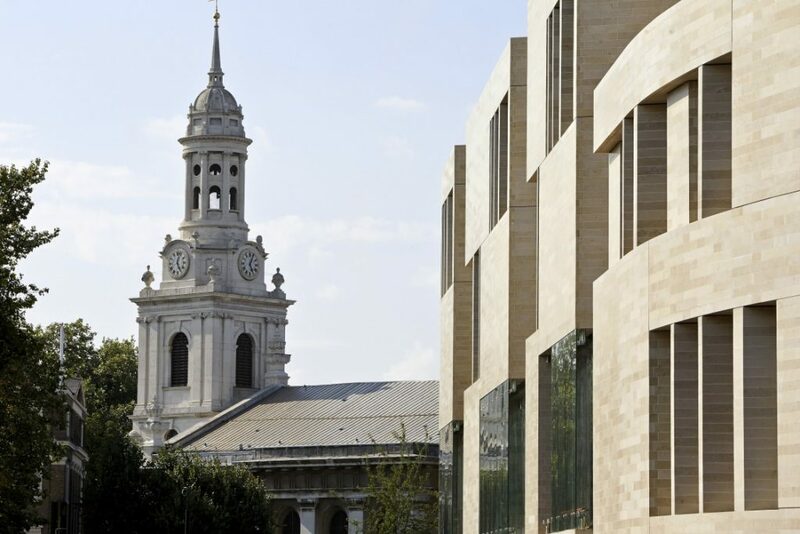 Most new building in such a context is too concerned with looking over its shoulder to achieve real architecture. So to do other than just a piece of urban knitting is a considerable achievement. It has also to be said that with the honourable exception of Westminster, few other schools of architecture are served by good architecture. This is a building that will inspire future generations of architects, and with their delightful experimental allotments on the roofs, of landscape architects: the building steps down to the rear, providing externally a series of generous terraces for the landscapers to experiment with a wide variety of layouts and species. Conceptually strong in urban design terms, it relates well to the street in terms of its materiality and massing. The building broken down both in plan and section into a series of smaller elements separated by courtyards and staircases, and articulated at the street level as a series of retail units. The plan follows a clear diagram with its parallel fingers of accommodation separated by courtyards which extend to break up the long street-facing elevation. Externally the forms are well articulated giving depth and interest, with fenestration carefully considered to take advantage of key views, vistas and reflections, particularly on the long side elevation facing the railway. The building is full of light and generous spaces and benefits from clear vertical circulation – the acoustics are remarkable.